In this relay race you will be blindfolding the children three at a time and handing them a gingerbread man. Using their teammate's help, they will have to walk the relay race passing the cookie back and forth until everyone has had a turn. Whichever team's gingerbread man is in the best condition at the end of the relay race wins! Divide the party guests evenly into three teams. Set up an area about 20 feet wide either indoors or outdoors. Split each team in half, and have them stand on opposite sides of the playing area. Now pass out the three gingerbread men to the first people in line on one side of each team. Blindfold the three children who are holding the gingerbread man. Voila! Three blind mice! Instruct them that while blindfolded, they will have to walk fast to their teammates on the other side of the playing area and pass the gingerbread man to the next person in line. It is the job of their teammates to verbally navigate the current "blind mouse" to the correct team. The blind mouse will have to listen carefully in order to pass Gingy safely. Once the first person reaches their teammates on the opposite side, they must hand over their gingerbread man, and then take off their blindfold. The person who is now holding the gingerbread man gets blindfolded and has to walk to their teammates on the opposite side. 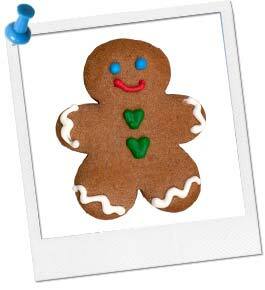 Each gingerbread man keeps getting passed until every teammate has become a blind mouse. When the race is over, whichever team's cookie has taken the least damage wins!